We look at modern marketing and some of the tactics that we have used to be able to grow our business. In Tech Focus, we look at my new Acer Great Wall of Data. I’ve put 4 x 27″ Acer monitors, with a special monitor stand. This has enabled me to create content a lot quicker because I can not only have multiple windows open, but I can see the windows I need with the information that I need. It is also great for customer meetings, being able to have all the data that we are talking about at the one time. When we started this podcast we had 15 staff and we have now just hit 25 people. How have we been able to scale this business? One part of that is finding the new customers to allow us to scale up. There are a lot of tools available these days, but a lot of Small Business Owners are running ‘boring’ businesses. I view Extreme as one of those. A boring IT business which people don’t want to see in their Facebook feed, so what kind of marketing is it that we have done. Yellow Pages is dead now, (well practically dead.) We used to spend $19,000 a year on Yellow Pages advertising, but it slowly started to become less effective. 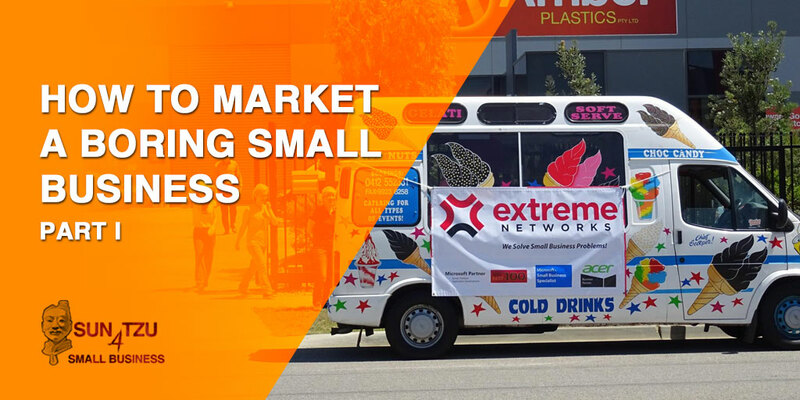 Business owners have had to work a lot harder to work out how you can market and scale your business. Too many now rely on Word of Mouth marketing, but this doesn’t scale and it can’t be controlled by you, you can’t double the number of word of mouth leads a month. We talk about the interesting ways that you can tell the story of what you do and how you tell that story. We created a video using Prism images. The video was then posted on Facebook and we ran an add to it. This went really well. We also use time lapse images. Time Lapse can make a lot of boring stuff look really interesting. We’ve done this with training seminars, our new sign being put up and even just the sign rising! Your suppliers. Too many people look down the value chain at their customers and ignore their suppliers. We got a new sign and tagged the guys at Signarama Frankston in on that. We created a time lapse video with a Go Pro. This was then shared by the the sign company and increased greater traction with the marketing. The next thing to do is to create conversions with your customers about topics that they want to have. We talk to prospective customers about our online marketing skills. (We don’t do a lot of marketing for our customers, most of our marketing team specialises in marketing for us, but we share the insights we have, mistakes we’ve made and wins that we’ve had and that creates that first conversion with our customers. It is a lot easier than trying to talk about disaster recovery or server upgrades.